It’s a Saturday morning at a formerly vacant lot in Richmond. The sun warms the ground. Rows of fruit trees bend in the breeze. A raised bed made of cinder blocks harbors vegetable plants. Andromeda Brooks carefully plucks weeds from her raspberry patch, offering the young plants encouragement. This is Happy Lot Farm and Garden. Less than a year ago, this 14,000-square-foot lot, zoned for low-income housing, lay empty, except for the litter. “Nothing has really been done on the lot for well over ten years,” says Brooks. Unused city-owned land in Richmond doesn’t get regular attention, as maintenance crews have shrunk. Brooks watched from next door as trash piled up, and she decided to take action. “I started in October with a block clean-up, a three-day block clean-up, with 60 volunteers and the mayor showing up,” says Brooks. 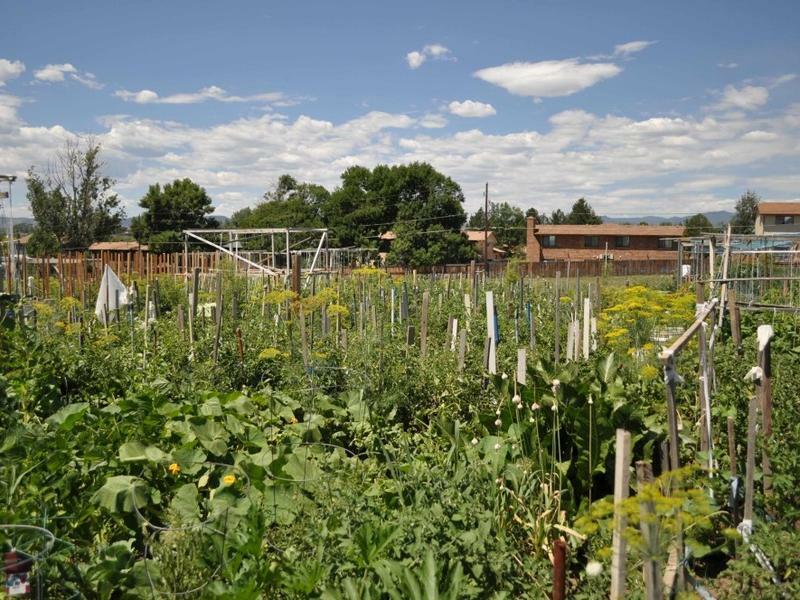 Once Mayor Gayle McLaughlin got involved, the city council voted to donate the lot to a local non-profit called Self-Sustaining Communities, so it could continue as a community garden tax-free. In Richmond’s Iron Triangle, another urban farm has grown on the parking lot of a former Bank of America building. “And there’ve been property-owners who have donated, partially or for a period of time, provided some of their space for gardens. So, we think there could be more,” says McLaughlin. Happy Lot Farm and Garden is a model for how the city can come together. Self-Sustaining Communities supplied fruit trees, and cub scouts planted them. High school students from Richmond and Marin built raised beds and the foundation for a greenhouse. Despite the support they offer, city governments often have limited control over what happens with vacated and foreclosed lots. In Richmond, for example, it’s Contra Costa County that takes over a property when the owner has not paid taxes. Open lots with good soil don’t come cheap in the densely populated Bay Area, and property-owners aren’t always willing to donate - or sell them - for cultivation. So would-be farmers sometimes use other methods. On Earth Day this year, a group called “Occupy the Farm” took over the fallow research fields at the Gill Tract in Albany and planted more than 70 rows of seedlings. The University of California, which owns the land, kicked out the farmers in mid-May. University researchers planted the area with their own crops, though University officials also allowed some of the Occupy plants to remain. The renegade farmers broke in at least three times over the summer, to harvest and distribute the fruits of their labor. The Gill Tract remains behind a tall fence and locked gates this fall, while researchers continue their work. But if the University decides to end its research on the tract, “there is a plan in existence that was formulated in close collaboration with the Albany community, with our neighbors there, that would call for that land being used for community space, open-area recreation, and, I believe, a community center,” Mogulof says. Across the Bay from Albany, in San Francisco, there’s a property bound by the I-280 freeway where cattails and fruit trees wave in the breeze. At four-and-a-half acres, Alemany Farm is unusually large for the space-starved city. Until recently, none of that produce could be sold, at the nearby Alemany Farmers’ Market or anywhere else, because the farm is a non-profit located on city land. It’s a confusing situation. For example, five years ago, the San Francisco Department of the Environment gave Alemany Farm a grant to sell fresh produce at a city-run farmers’ market dirt-cheap, like a basket of strawberries for a dollar. “Then, our landlord, the city’s Recreation and Park Department, said, ‘Oh my God, you’re selling the food? !’ ‘Yeah,’ we said, ‘we got a grant from this one city department to sell the food.’ They said, ‘No, you can’t sell the food! You’re a community garden.’ Clearly, the right hand didn’t know what the left hand was doing,” says Mark. A new city law passed this summer addresses both the administrative mix-ups and the distribution of urban produce. The ordinance streamlines the permitting process, to make starting new urban gardens in San Francisco easier. In the past, seven city agencies gave money, while eleven different agencies supplied land. “But unfortunately the support of all these different agencies has not been coordinated, has been highly understaffed, and frankly, pretty inefficient,” Chiu says. Under the new law, one city agency or non-profit will shepherd wanna-be farmers through the permitting process. Alemany Farm isn’t on private land. It’s public. But that’s part of its purpose. The farm holds “You Pick” sessions every Wednesday for their next-door neighbors, the residents of the Alemany Housing Development. Mark says only a handful of families take advantage of the sessions. Not everybody knows how to prepare vegetables from scratch. So he’s hoping to build an outdoor kitchen and teach people how to cook fresh food. “In terms of deciding you’re going to come up here and pick three pounds of green beans, if you’re not cooking it, you have no use for three pounds of green beans,” Mark says. Growing food in cities, near the people who will ultimately eat it, makes practical sense. In Richmond Andromeda Brooks’ farm will hold its harvest this month. The Albany Gill Tract brought together disparate groups who want to preserve the land for farming. And Alemany Farm has become well established in San Francisco, sharing its bounty with local low-income families, with designs to take it a step further with a community kitchen. These initiatives mean that putting local produce on dinner tables should be getting easier soon.